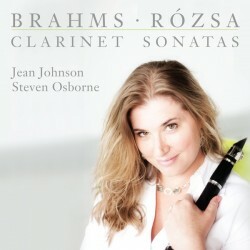 Husband-and-wife team clarinettist Jean Johnson and pianist Steven Osborne come together for a recording of Brahms’ popular Clarinet Sonatas, uniquely paired with the rarer sonatas for clarinet by Miklós Rózsa, in which Johnson steps into the spotlight on her own. Brahms’ appreciation for the clarinet came late in his career – his two Sonatas were the last chamber works he wrote. The Hungarian-born Rózsa, known universally for his Oscar-winning scores to such movies as Spellbound and Ben-Hur, was equally admired for his classical compositions which were championed by the likes of Heifetz and Piatigorsky. His two works for solo clarinet spanned 35 years, both written after he’d settled in Hollywood, the latter just two years before his death. Jean Johnson is an avid chamber musician. In addition to performing regularly with her husband, Steven Osborne, she has collaborated with leading musicians in the world’s foremost venues, including pianist Barry Douglas at Carnegie Hall and on the “Bridge” contemporary music series at Lincoln Center.